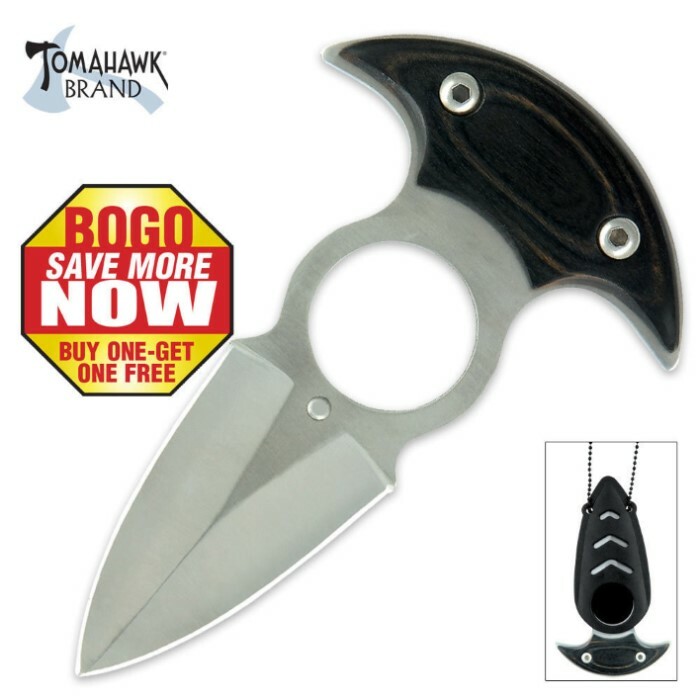 Tomahawk Raider Push Dagger 2 for 1 | BUDK.com - Knives & Swords At The Lowest Prices! Suspend this covert defender from your neck and know you're secure 24/7. Nice blade but loose in sheath. Can be fixed easily. Good deal two for $6 dollars! The plastic sheath is not secure enough to use as a neck knife without modification. It holds the blade too loosely and it can be shaken out when inverted. This can be easily remedied with strategic application of duct tape or anything that will keep the edges of the sheath pinched closer together. After this is corrected it is perfectly suited as a neck knife. The actual push dagger is made well and is a great value for the price. If a small bit of effort was put into improving the sheath by the manufacturer this product would be awesome. The blade has two protusions intended to lock into two indents on a sheath, the sheath included has no such indents. Basically, the actual push dagger is great for the price, even with the sub par cheaply made sheath it comes with. I bought two of these on sale for $6 and will definitely say they are an excellent value at that price. Great deal for the price. very cool knives.